Primarily an evening bar I think, loads of candles and low level lighting especially towards the back of the bar. The upholstery is a bit ragged so either they're going for the distressed look or think that people won't notice in the dark. Two handpumps and a decent selection of keg beers, I had the Sierra Nevada Pale Ale which you don't find in too many places. Not one for the pub purists but a decent chilled out bar that has regular DJ nights. I love this bar to go to on a sunday afternoon and just chill. Excellent coffee, good atmosphere. Just as good in the evenings though I didn't frequent as it was easier to go into central Edinburgh. Good decor. 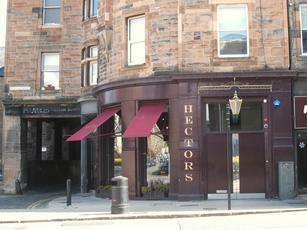 I preferred this pub as Maison Hector's, before it was re-furbed as just Hector's. It's still OK. Beer is cold and it's a good place for people watching or to have a drink before you go for something to eat. Used to do live Jazz music on a Sunday but not sure if they do that anymore.